This is 100 yen? A Yen is worth about a penny. This shows it more expensive than the dollar. Sorry for the confusion. 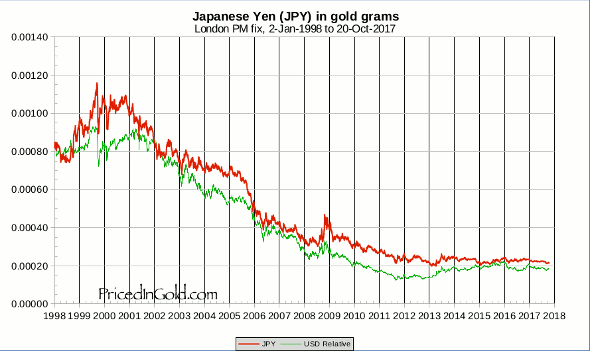 The red JPY line is in grams of gold (I probably should redo these in mg or ug). The green line is an artificial index that tracks the USD, but starts at the same level as the JPY on the start date for the chart. Thus it shows whether the JPY is gaining to losing relative to the USD over time. It’s sort of like the % change graphs sometimes seen to compare two securities, except that the JPY numbers on my chart are in grams, not percent. Again, sorry for the confusion. 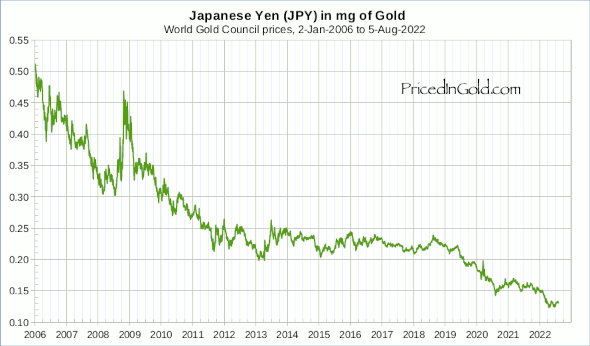 It seems to me that JPY is more or less tight to gold in recent years. Any comment on that? That is because as the price declines, changes in relative % are smaller. I've said it in another charts, but the price in gold should always be in logarithmic form.